How influential can Verbum be? Steve Ray used to have a library 20,000 physical books, but after immersing himself in the usefulness of Verbum, he made the decision to downsize his collection to 10,000 physical books. If you are using the software regularly, you understand how amazing is the ability to search deeply into any text and easily find a connection within any other resource. In the time it takes to find a physical book and pull it from the shelves, Verbum can have you studying a topic and discovering more about it than you could ever imagine. This is why Steve Ray was compelled to downsize his physical library. There are plenty of great resources on sale and Steve’s two books can be seen here. 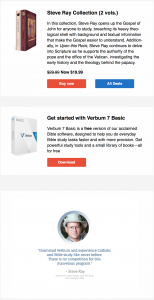 Many resources this month to help deepen your studies, but they end May 31, so take advantage of these resources while you can, and explore them like never before with the power of Verbum. Visit HERE to see what Verbum can do. Use Promo Code STEVERAY10 for a 10% discount.